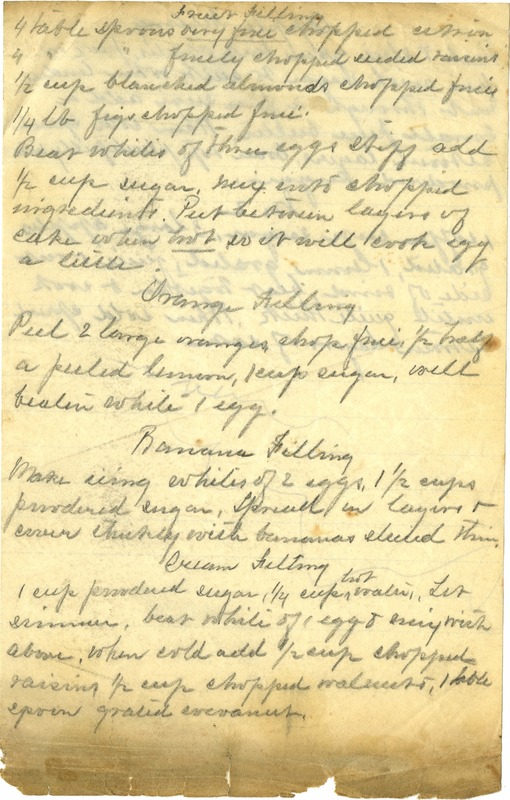 Fruit fillings 4 table spoons very fine chopped [illegible] 4 " " finely chopped seeded raisins 1/2 cup blanched almonds chopped [fine?] 1/4 lb figs chopped fine Beat whites of three eggs stiff add 1/2 cup sugar, mix into chopped ingredients. Put between layers of cake when hot so it will cook egg a little. Orange Filling Peel 2 large oranges chop fine, 1/2 half a peeled lemon, 1 cup sugar, well beaten white 1 egg. Banana Filling Make icing whites of 2 eggs, 1 1/2 cups powdered sugar, Spread in layers & cover thickly with bananas sliced thin, Cream Filling 1 cup powdered sugar, 1/4 cup hot water, let simmer, beat white of 1 egg & mix with above, when cold add 1/2 cup chopped raisins 1/2 cup chopped walnuts, 1 table spoon grated cocoanut.